Drive this special vehicle and you will always wish you owned it. The Infiniti Q60x is an all-wheel drive rocket ship. Powered by a 3.7 liter, V6 with over 300hp, the super reliable Infiniti engine is the envy of all car manufacturers. Combined with all the luxury options you can imagine this sleek coupe will take you from the front range to the mountains in style. Complete with : All-wheel drive, Sunroof, Navigation, heated and powered seats, newer tires, sport alloy wheels, sport steering wheel, 7 speed automatic transmission with manu-shift, HID head lamps, back up camera, blue-tooth and so many more options. This Infiniti has been driven an average of 10,500 miles per year. Please call 303-247-9300 to schedule your test drive at any one of our Colorado locations (Boulder/Denver, Northern Colorado-Loveland, Colorado Springs / Southern CO-Durango). AutoSearch USA has been providing quality New and Pre-Owned vehicles to our Clients for over 20 years. 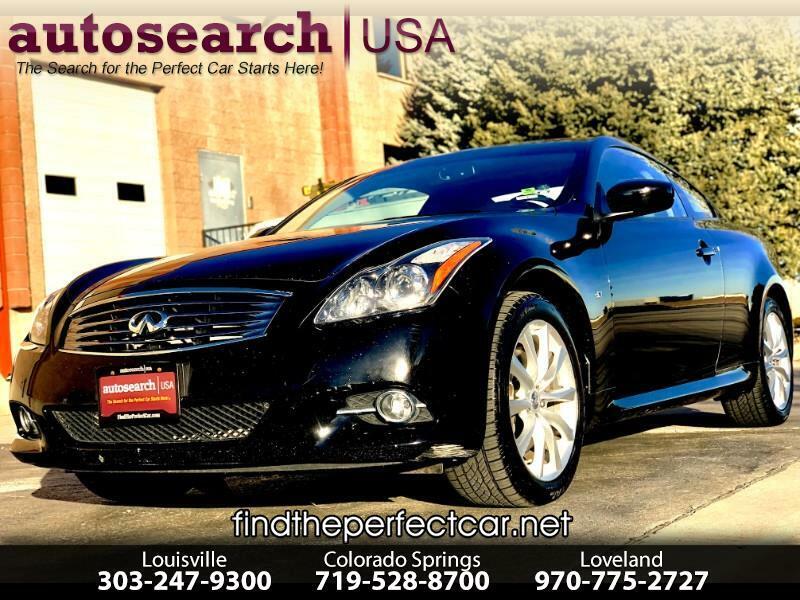 We specialize in finding your “perfect car.” If this Infiniti does not fit your exact needs please call us as we have access to hundreds of lease return vehicles of all makes and models. Thank you for viewing this incredible automobile. We look forward to the privilege of serving you.